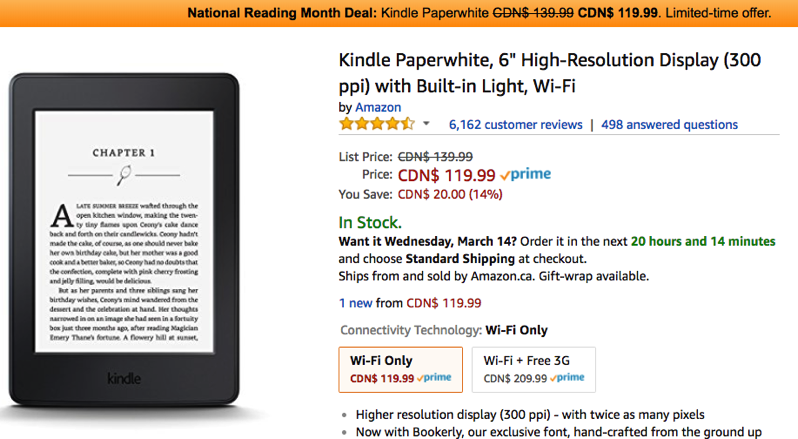 March is National Reading Month and Amazon has launched a sale on their Kindle Paperwhite e-reader, offering the popular device for $20 off the Wi-Fi model at $119.99, saving you 14%. The Kindle Paperwhite comes with a 300ppi high resolution 6-inch display and has a front-lit display, which makes it easy to read in low-light environments without eye strain, compared to LCDs. The device has 4GB of storage and ‘weeks’ of battery life. With the Kindle WhisperSync feature, all your bookmarks are saved to the cloud, so you can continue where you left off on any device, including your iPhone or iPad, with the Kindle iOS app. Click here to jump on the Kindle Paperwhite sale while the limited-time sale is still available.